Today, Mises U is coming to a close, with a live-show of the ContraKrugman show & Mises Weekend, as well as games, cookout and – examination. 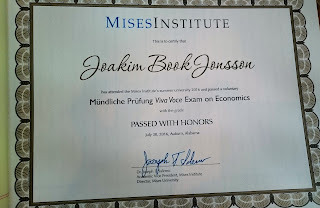 When I passed the written exam back in 2014 and went onto the first stage of interview-style examinations, I was still a freshie to Austrian Economics. Suffice to say, I was frightened to pieces. Dr. Salerno, Dr. Block & Dr. Woods crossed their arms, fixed their gaze firmly on me and saw straight through my feeble attempts at organising my answers. I obviously didn’t qualify for the next stage, and I have since described it as the most intimidating experience of my life. Now I have a new one. This year, to my great delight, I passed the that stage of the examination and my surprise and happiness was inexpressible; I did good enough! Out of all these brilliant people, I moved on to the next stage. I am in the final, in the draw for a whole lot of money and - more importantly - academic recognition! As I stepped into the conference room for the final, my legs barely carried me and my hands were shivering like an old lady. I tried to regain some control by breathing deeply and excusing myself for being so nervous. Breathe in, breathe out. I’ve got this. And so the torture began. Every single one of the dozen faculty looked at me, scrutinized me, eager to find out if my understanding of this subject we all love was to their liking. And they started firing question after question on intricate topics of all of Austrian Economics. I initially staggered, gave some horribly bad attempts at answers - some more wrong than others - while desperately searching through everything I knew for any knowledge I could grasp on to. None came to my rescue. Mercifully, they moved onto the next question and while I tried to calm down and intently listening to the phrasing of the question, I realized that the next was even worse than the previous one. And so it continued for what seemed to me an eternity, but in reality was more like five minutes. I managed maybe one-and-a-half decent answers, while completely messing up the other half-dozen questions. Having a sizable group of the world’s leading scholars of our tradition staring at me and demanding answers is scary enough. Knowing that all the work they’ve spend on teaching me, the effort they’ve laid down over the last week to ensure my intellectual furthering in this magnificent science – not to mention the impressive patience with questions in the hallway or over lunch, and the money the Mises Institute has spent on me – I so desperately wanted to please them. Show them that their efforts were not in vain. That I've read broad and wide, and my knowledge is good enough. I'm sad to realize that it wasn't. I got through to the second stage of interview-examination, I passed with honors, but I failed miserably. My best, most highly-praised academic achievement ever - quickly followed by the most intimidating experience ever. 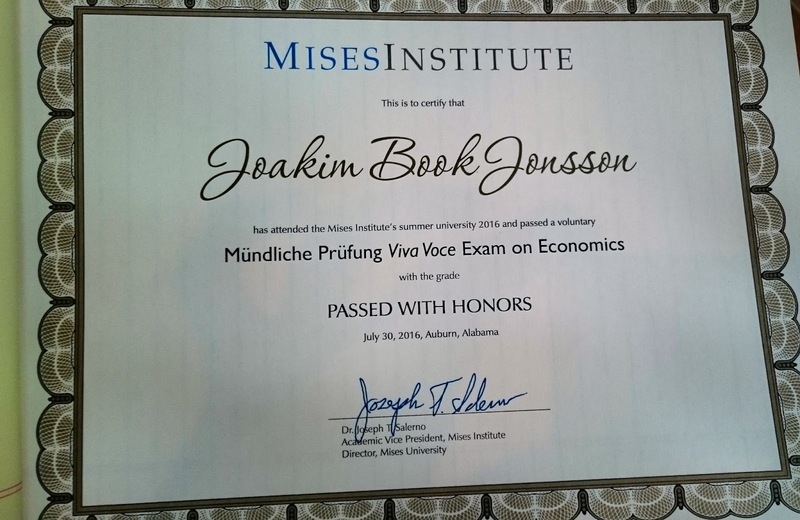 Mises U sure delivers! And now I have at least another year to improve - pretty darn inspiring!